Hi guys. Welcome back to this MailChimp course. In this section we’ve started taking a look at templates. And in the previous video we looked at basic templates. That’s where we stopped. And in this video I want us to take a look at themes. So, click on templates. Let’s create another template, “Create Template” . Then we click on themes. So basically what themes are , these are predesigned templates on MailChimp which you can leverage in designing your own templates. So, if you scroll, you’ll see there is a bunch of them and at the same time, we have a way to trim them down . So you can take a look at featured, you can look at templates based on your industry. So you can take a look at all the ones that are available . I have seen one here, photography, I’d love to see these ones. So these are the ones we have for photography. So, you’ll just come here and choose for whichever industry or you can just go through them one by one. I think this will serve me well . I can click on it and preview it. So you can preview it, that’s how it is. Then this is how it will be on mobile. So I’ll select it . It’s basically the same , the same same principle . So let me click edit . So I’ll save and close . Then I’ll come back here . Ok this is standard I can just leave that the way it is . Then I’ll come back here to change the image. Edit. You can remove the Image , You can replace the image, let me replace the image, with one of mine. Let me use this one. Select. Then I’ll Save and Close. Then I’ll click edit . If you have added your Twitter and Facebook on MailChimp, if you haven’t , you can just remove that bit. I don’t want to add any images there. But I’ll edit this section….Save that bit and close….Then add the link here, Insert , Save and Close … , Save and Close…Add the link, Insert , Save and Close. And since I chose a very simple theme, you can see how fast this has been. So you can remove a section . As you can see you can remove a section, you can copy this section or add another section . This part really comes from MailChimp and I don’t really need to change this. So let’s say that I want to add another section, you’ll just click on that and it will add. You see this. But I don’t need this section so I’ll remove it . I will go to preview. Let’s preview what we have . It’s a very simple theme . There you go. So apparently this theme is not very responsive but you can try some theme else. Let’s save and exit . I will call it…then Save. So this video has shown you how you can create a theme template. If you are not already within templates, you’ll click templates , then click on create new template . Once you click on create new Template, you will go to the themes area , choose a theme and edit it. Just that. Okay guys, go to the video playlist. 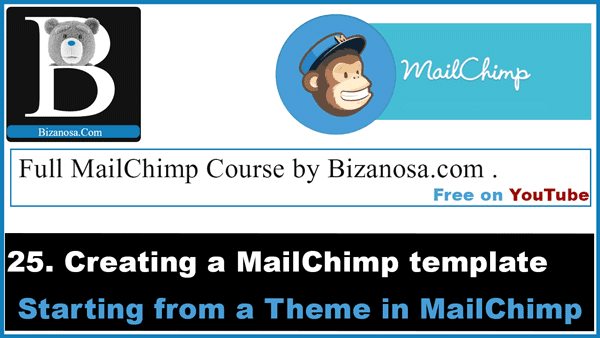 Watch the entire course on MailChimp . Subscribe to my channel , share the videos with people that need the knowledge . In the next section we’ll take a look at the last bit which talks about code your own Templates. This is whereby you have a premium template. You have purchased a premium Template from Themeforest. I will create a link below where you can check out the templates, some of the Templates that are available , or maybe you have downloaded a Template from the Web and you just want to use that . SO that’s what you’ll cover in the next video .